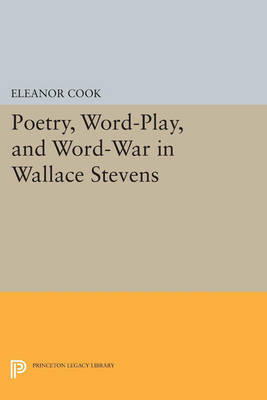 In the first full-length study of Wallace Stevens's word-play, Eleanor Cook focuses on Stevens's skillful play with grammar, etymology, allusion, and other elements of poetry, and suggests ways in which this play offers a method of approaching his work. At the same time, this book is a general study of Stevens's poetry, moving from his earliest to his latest work, and includes close readings of three of his remarkable long poems--Esthetique du Mal, Notes toward a Supreme Fiction, and An Ordinary Evening in New Haven. The chronological arrangement enables readers to follow Stevens's increasing skill and changing thought in three areas of his "poetry of the earth": the poetry of place, the poetry of eros, and the poetry of belief. Poetry, Word-Play, and Word-War in Wallace Stevens shows how, in setting words at play and in conflict, Stevens could upset the usual relations of rhetoric, grammar, and dialectic, and thus the book contributes to the current debate about logical and a-logical uses of language. Cook also places Stevens within the larger context of Western literature, hearing how he speaks to Milton, Keats, and Wordsworth; to such American forebears as Whitman, Emerson, and Dickinson; and to T. S. Eliot, his contemporary. Originally published in 1988. The Princeton Legacy Library uses the latest print-on-demand technology to again make available previously out-of-print books from the distinguished backlist of Princeton University Press. These editions preserve the original texts of these important books while presenting them in durable paperback and hardcover editions. The goal of the Princeton Legacy Library is to vastly increase access to the rich scholarly heritage found in the thousands of books published by Princeton University Press since its founding in 1905.